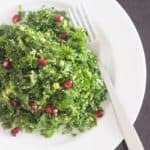 I love avocado in any form: diced on a taco, blended into a green smoothie, mixed into a chocolate dessert or here, as a delicious, creamy dressing for an easy southwest salad. Ready in minutes, this southwest salad is a quick, weeknight option. Simply blend the dressing ingredients, chop and combine vegetables and beans in a bowl and you’re ready to go. 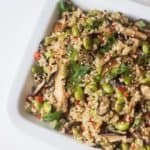 The tortilla chips and pumpkin seeds add great texture. I also love this dressing on tacos and burritos. Swap the romaine with baby spinach for even more vitamins and minerals. You can also vary the types of beans or add in other chopped veggies you have on hand. Shredded cabbage, diced jicama, sliced zucchini and black olives are also delicious additions. 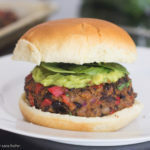 Looking for more quick vegan meals? 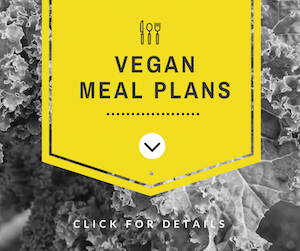 Check out my simple vegan meal plans, ready in under 30 minutes! In a blender or food processor, combine avocado, tofu, scallions, cilantro, garlic, lime juice, agave nectar, cumin, cayenne, water and salt. Blend until smooth. If dressing is too thick, add a bit more water until it’s a pourable dressing consistency. In a large bowl, toss, lettuce, tomatoes, pinto beans, corn, red onion, tortilla chips and pumpkin seeds. When serving, drizzle each with dressing.